We tend to think of mixing as something that can completely even out those things being mixed. As an example, let’s assume you are making chocolate chip cookies and would like to have 10 chocolate chips in each large cookie. You make enough batter for 100 cookies and then mix in 1,000 chocolate chips. After mixing for a long time you put 100 dollops of the batter on the baking pan and bake up the cookies. Upon inspecting the cookies, to your dismay, you find that you have only 13 cookies with 10 chocolate chips. More than 40 cookies have 30 percent more or 30 percent less than 10 chips. Worse yet, 3 cookies have 4 or less chocolate chips and 7 have 16 or more. See the graph below. You decide that you did not mix them enough, so you make another batch and mix for 4 hours. The results are the same. Statistics tells us why the above scenario is so. In a case like this one, the number of chips in a cookie is described by the Poisson distribution. The mean will be 10 chips, since we are using the Poisson distribution, the standard deviation will be the square root of the mean or 100.5=3.16, or about 3 chips. One way to assure a more even distribution of chocolate would be to divide each chip into 10, so we would have 10,000 smaller chips in a batch. 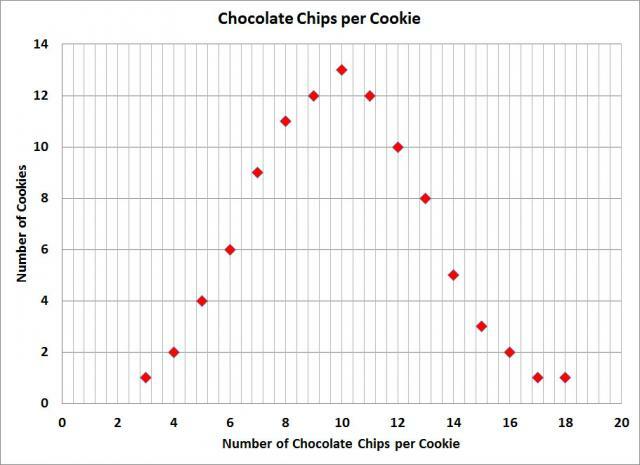 On average each cookie would now have 100 chips and the standard deviation would be 10. Plus and minus one standard deviation is about two thirds of the data, so two thirds of the cookies would have +/- 10% of the desired amount of chocolate, a much better result. If we divided the chips into even smaller sizes, we would further tighten the distribution. How does any of this relate to solder preforms or solder paste? In the new world of lead-free solder pastes, where it is common to have 3 or 4 alloying elements, some in very small concentrations, it can be difficult to control the concentration of the alloying elements throughout a sample of the alloy. The limits of mixing are just part of several processes that are required to assure that a modern lead-free solder has a consistent formulation. These are some of the topics you should discuss with your solder supplier to assure that you get consistency in any solder alloy you purchase. Asking to see assay analysis of a solder alloy is often a good idea, too.